Singapore is not only an amazing destination for sightseeing, but also for amazing food tasting.When you book your Singapore tour package, make sure that you have some time at leisure to try out the amazing Singaporean cuisine. Here is our pick for the best 10 food items that you should not miss when in Singapore.To enjoy a seamless journey, book a Singapore visa and experience Singapore like never before. Sweet, spicy and tangy chilli crabs are best eaten with buns alled mantous dipped in a uniquely flavoured chilli sauce. The crabs are twice-booked- boiled and then stirfried. 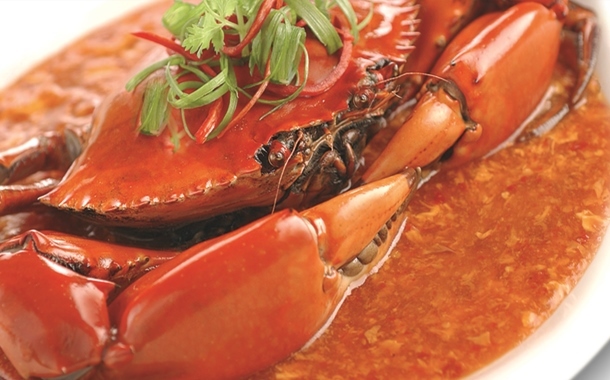 Chilli Crabs have also been listed as one of the ‘World’s 50 most delicious foods’ by CNN Go. Did you know that chilli crabs were made famous by a poor couple when they started selling the dish on a pushcart? This is no dessert! Prepared from stir-fried radish cake cubes (shredded daikon steamed with rice flour and water), eggs and preserved radish, this cake is eaten for breakfast,lunch, dinner or even as an appetiser. The main ingredient red radish or daikon or Singaporean carrot gives this dish its unique name. Dim Sums are Cantonese styled bite-sized food served in steamer baskets. Try a variety of Dim Sums including Xiao Long Bao, BBQ Bun, Chee Chong Fun, Har Gao and many more. In Singapore, you will find Dim Sums everywhere- on streets, in hotels and in supermarkets as ready to eat frozen Dim Sums. Due to its increasing popularity, some restaurants have an exclusive Dim Sum buffet too. Make sure you try this lip-smacking snack when you are enjoying your Singapore tour package The way Indians boast about ‘French Toast, Singaporeans boast about Kaya Toast with soft-boiled eggs. Kaya (coconut & egg jam), coconut milk, butter/margarine and some sugar; are mixed just in the right blend to dish out the kaya (meaning rich) flavour. The Peranakans which descended from China got this beautiful noodle-soup to Singapore. Traditional Laksa consists of coconut milk, vermicelli, fish cakes, shrimp and cockles (a shelled seafish). Don’t miss out on variants like Curry Laksa, Asam Laksa, Johor Laksa, Sarawak Laksa and more. Popular in Singapore and Malaysia, Fish Head Curry is a must-have at any local hawker. There are predominantly 3 versions of the dish that are popular all over Singapore- Indian (spicy and bold), Chinese (mild and flavoursome) and Peranakan (Assam-styled sour and spicy). Take your pick at any of these styles and we guarantee that you will not be disappointed. Literally, the ‘ABC of desserts', Air Batu Campur, meaning 'mixed ice' is a cold, sweet dessert comprising of shaved ice, jellies, various types of syrup and anything that is sweet! Kill the heat with a bowl of Ice Kacang and get rejuvenated. Rojak literally meaning mixture is an assortment of dough fritters, bean sprouts, bean curd puffs, radish, pineapple, cucumber and roast peanuts. It is later tossed with a black fermented prawn paste to give it a nice piquant flavour. There’s an Indianised version of this recipe too, interesting; isn’t it? Go on try it and tell us how it was! When the labourers got hungry, they made a dish loaded with fats and carbs for instant energy. So, they mixed flat rice noodles, eggs, pork lard, sausages and fish cake and gave birth to this national favourite dish. Derived from the South Indian dessert Puttu, Putu Piring is a sweet-dish made by steaming rice flour with gula melaka mix. It is one of the best desserts to have in Singapore. Eat it with fresh desiccated coconut and your day will be made!